Hope that they can sell them to a sensible price because only period looking option 145r10 at competitive price are CAMAC as DUNLOP are expensive. I shall buy a set for my S. I always loved the SP3. Great news. I emailed them a while back asking if there was any news and I never heard back from them. When the SP3 first came out in the 145 x 10 size they were really hard to get. In fact, you needed a contact at Dunlop Competitions Dep't and a competition licence to be able to buy them. I recall parking my Cooper rally car in Hitchin and a two guys were looking at it. When I went to get in one said "Wow, you have got those new Dunlops. Where did you get them"? Even on normal regional area championship rallies only a few people had them. However, when I fitted them to my first Mk.1 Cortina GT they were not very good in the wet. Now we need a source for the original 145 x 10 SP44 Weathermaster. I thought you could still get 145x10 Weathermasters. I don't know if the pattern has maybe changed but there is definitely a Dunlop tyre in that size with that name available. The SP44 was recently re-manufactured from new tooling when enough Mini and Moke owners responded with pre-orders for a set. I emailed Blockley yesterday enquiring if they had a release date and expressing interest but haven't had a response just yet. "We have had all sorts of delays, and I'm sure you will have made other plans - but the Blockley 145R10 mould is nearly finished and the tooling for the steel belting also manufactured ready, so I should have the sample tyres by mid to late July, after which it's E marking etc and the production - so we're on the last stretch! Received an email back from Blockley this morning. anticipated! But we are almost there. be fitted with tubes, although I'm sure many don't. steel belting in the carcass construction. different from why others do this. PS I'll keep you updated when the tyres are close to availability." something else to put on the christmas list maybe.. Apparently the prototype 145 tyre is on display at Stoneleigh Restoration show today. They should be available by the end of the year. S speed rating and E marked. Edited by mab01uk, 28 October 2018 - 07:04 PM. I've written my letter and I'm posting early to Father Christmas. 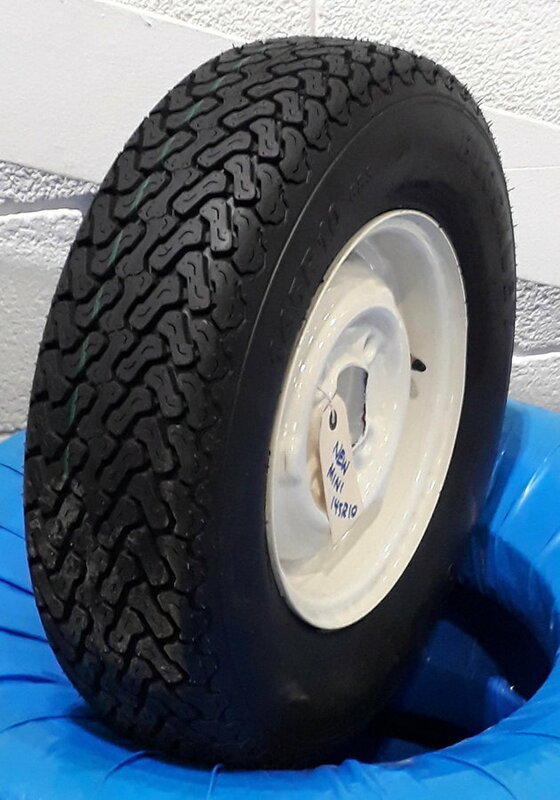 The 145 tyres were on show at the NEC, £75 each in the Jan 2019 price list so on their way for the New Year. Apparently a 165 will also be available at the same/similar price. Blockley are at the London Classic Car Show with this 145 sample £63 + VAT & delivery. Same price for the 165 which is to follow. They hope to have them in stock and on sale later this month or in March. Edited by mab01uk, 15 February 2019 - 10:00 AM.